Daily Spirit & Word: 683. Courageous Endurance. Encouragement from our Brother in the Faith, John the Apostle. Good morning my friends, when we’re suffering for the faith of Jesus Christ, if we keep in mind our constant hope, to be with the Lord in His Kingdom forever, then we’re going to endure great hardships with gratitude and thanksgiving in our hearts. Why? Because Jesus never promised us it would be easy, but that if we follow Him, we will be persecuted. On Wednesday I had the wonderful privilege of leading a family to faith and trust in Jesus as Lord. It was amazing, definitely a God appointment. There were obstacles to overcome though. Four people, in very humble circumstances, received Jesus as Lord. We sat on the floor of their one roomed flat. A mother, two sons and a girlfriend came as they were to Jesus. I’ll tell their story (with permission) later. I am your fellow in God’s Kingdom. I am with you practising patient endurance. I am, like you, suffering for preaching the Word of God and giving testimony of Jesus. Nobody likes it when someone who is privileged or has a life of ease tells people who have nothing how to patiently endure their hardships. Why don’t people like it? Because a person who has everything, doens’t know what life is like with nothing. It’s a bit like our Government Ministers who are living in luxury and with a great salary, proclaiming they are going to cut the benefits that the poorest people in society receive. Not only that, but they cut the taxes that the richest people pay. Where is the fairness in that? They tell the poor people, “Get a job” then you won’t need benefits. However, the wages that the poor receive for the jobs they take, don’t cover their living expenses. So the poor get poorer and the rich get richer. No wonder those on benefits resent our Government’s unfair policy. I think that’s why Jesus chose fishermen and outcasts to be His closest Disciples, because they’d been through hardships, they knew what life was like with nothing. One time Jesus followers had been fishing all night and had caught nothing. Imagine working hard for no wages? They knew what it was like to struggle and to suffer, so when they preached the Gospel, the people knew they were ordinary men once, just like them. They were not drawn from high-society, not many were of noble birth or princes or entrepreneurs, not many of Jesus Disciples were born with a silver-spoon in their mouths. No my friends, nobody likes to hear a message about endurance, if the one delivering it is not a partner in the suffering as well. 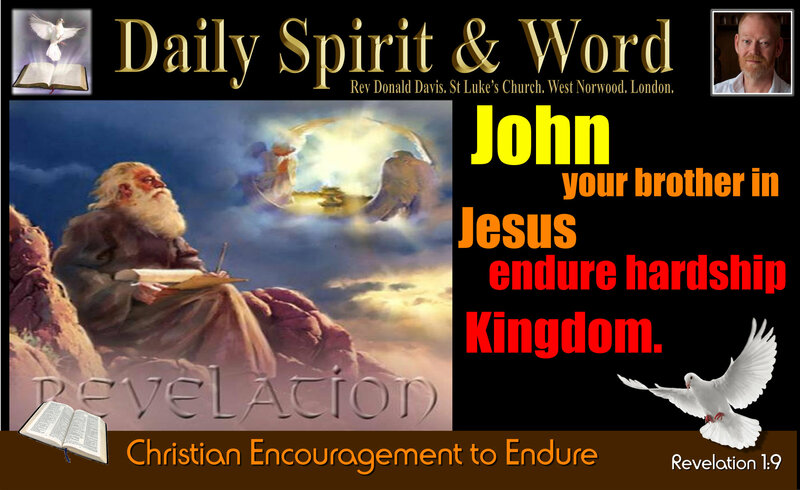 John had to endure great hardship for the sake of the Gospel of Jesus Christ. He was in EXILE on Patmos because of the Word of God and His Testimony about Jesus Christ. Because he wouldn’t stop preaching, they sent him to a lonely island and imprisoned him there, but did that stop John? No! God’s ways are far higher than our ways. The Lord had planed that exile for John long before the Authorities had even thought about it. Nothing takes God by surprise my friends. Everything you go through in life, God knows about it in advance. You might end up marooned on an Island like John. I hope not, but if you have to endure any hardship for Jesus, it’s not the end my friends, it just might be a new beginning. An opportunity to serve the Lord in a different way. The Words Endurance: It was originally an expression in Greek for the pressure a large stone could exert: I.e. Like a mill-stone on wheat. Imagine you are a grain of wheat and you see the great mill-stone rolling your way, there’s no way to escape, you’ve just got to bear the crushing pressure. Will you survive? My friends, in Jesus, in His Kingdom, we can and will endure anything for His sake. You may be experiencing great pressure because of your faith in Jesus Christ today. We are, because society is becoming increasingly intolerant of those who have a sincere desire to follow the teachings of Jesus and live according to the principles of God’s Word. Why? Because they’re bringing us into conflict with a world that wants to go it’s own way instead of God’s way. The world has chosen to uphold detestable lifestyles as good, and is now coming down hard on those who don’t comply or agree. Think about how the world has chosen to play around with human eggs, thinking that a fertilised egg is just an embryo or a foetus instead of the truth, it’s a baby. It might be a very small baby, but when an human egg is fertilised by sperm, then life has begun. We are forbidden from killing babies by God’s Word and indeed for any form of murder. Now if you show people pictures of aborted babies you are the one who’s classified as an extremist or being too dogmatic. You might find that you are in a prison one day, like John, for proclaiming God’s Word and giving Testimony about Jesus. Don’t be surprised when that happens, because my friends, God is not. He has warned that in the last days, things would take a turn for the worse. When John Said Endure Patiently: He LIVED it Himself. 16 keeping a clear conscience, so that those who speak maliciously against your good behaviour in Christ may be ashamed of their slander. 17 It is better, if it is God’s will, to suffer for doing good than for doing evil. My friends, Don’t FEAR what the world FEARS. He’s with you, through everything, endure to the end. The Tough Get Going: In Jesus. Praying that you are going to experience the closeness of Jesus throughout all your trials. Don’t grow weary or loose heart, but instead persevere and endure with patience and joy in the Lord, and don’t stop preaching or teaching what Jesus commanded my friends, keep snatching souls from the flames licking at their feet. Amen! Here you’ll discover what we can do, when we face unjust opposition and persecution for the faith of Jesus Christ. Previous PostPrevious He is my EVERYTHING, He is my ALL.